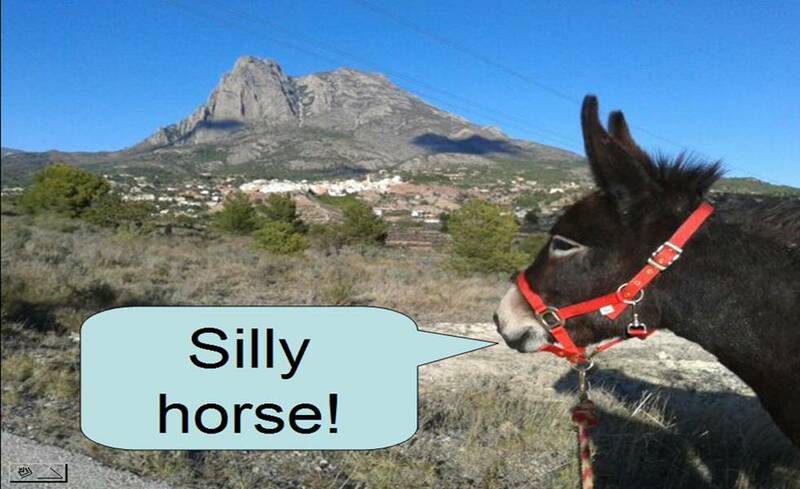 When I am introduced by friends to a newcomer or visitor to the Costa Blanca, there is always mention of the donkeys. So, a typical introduction is, “This is Gareth who has four donkeys.” Sometimes there is a longer version: “This is Gareth who bought two donkeys and they were both pregnant, so now he has four.” If this introduction is in the context of a meal, this usually leads to further questions and I have to account for the entire history of my involvement with donkeys. Does this happen to people who have four cats, or four poodles, or four budgies? No. And it is probably nothing to do with the size of the animals either: people who have twenty horses are not seen as unusual. They run a stable, so what? It seems that having four donkeys is uniquely regarded as an unusually excessive number, indicating an obsession and somewhere on the continuum towards insanity. Anyway, last week I was introduced to a school visitor by a teacher colleague as “Gareth, who has a donkey farm.” A what…? A donkey farm? Where did that come from? I recalled that three years ago the head of the primary school arranged for the children to visit my donkeys, and she billed it in the letter to parents as “a visit to Mr Thomas’s donkey farm,” so I suppose that was where the idea originated. I didn’t really take any notice at that time. This time, however, I stopped and thought about it. Can my lovely life with the donkeys at El Parral be called farming? It is now a gloriously four-days-a-week life, as I am only working three days a week teaching, and it is a bit like running a hobby farm. I am spending much more time now on growing food for myself, attending to the fruit trees, managing the terraces and the immediate environment. Yes, the daily involvement with bales of straw, mixing alfalfa with a pitch-fork, managing thirty big bucket loads of manure a week, etc. looks very much like the sort of thing that happens in farming. But is it a “farm”? And yes, I might regularly appear in the village shop or bar in my blue bib-and-brace overalls and a straw hat (or lately in the colder weather, a wool hat); but am I a farmer? Well, no, I’m not. And El Parral is not a farm. To claim that would be to miss the point entirely, that farming is an economic activity and a farm is an economic unit with inputs, processes and outputs; playing its part in the local and wider business life of the country. Likewise, if I cut down the occasional tree on the estate, that doesn’t make me a lumberjack. Why this extended discussion about the nature of farms and farming? In my job as a teacher of Geography (now a gloriously three-days-a-week routine) I have to teach about farming and at the moment I happen to be teaching both the GCSE unit on farming and the A-level advanced option on Production, Location and Change, including the dynamics of agriculture in the globalised economy. While I am not running a “farm”, the daily contact with the annual cycle of sowing seed, growing, pruning, soil management, animal care, upkeep of various machines like generators, chainsaws, etc. ; and the careful management of a budget for all of these activities, gives me two advantages when teaching the secondary students about farming. First, I can explain some of the practical aspects with more clarity: for example, we are doing a case study of the local nisperos (loquat) production in Callosa d’En Sarria, and I have my own nisperos tree, so I am very aware of the precise micro-climate factors in the production of this fruit. Mine is at least six weeks behind the growth of the main crop, which is exported to Japan, because the micro-climate in Callosa only 20km away, is more fine-tuned to the needs of the fruit. My nisperos are in the valley and get only two hours of sunshine per day. Second, the daily involvement with four large animals, frequent contact with local farmers in the neighbouring estates and in the local farm supplies shops, and the way this opens up questions about farming today, gives me a keen interest in the concerns of farmers. I listen to the BBC’s Farming Today and On Your Farm and although a whole episode about lambing in the West Country has very little connection with keeping donkeys in the Costa Blanca, I have developed a love of country life which I didn’t have before. (Although I draw the line at listening to The Archers and immediately the theme tune begins I run across the room to turn it off. *) Even when I lived in Canterbury, Kent, before moving here to Spain, I had very little real interest in what was happening in the Garden of England, with its hops and apple orchards. The thorough immersion in country concerns has come late in life for me. I know many people turn to gardening and the more sedentary cares for some retirement plot as they reach their mature years, and that is probably a factor for me; but there is more. In the light of the disastrous Brexit vote, I am more than interested to know just how agriculture is going to work as Britain leaves the Common Agricultural Policy. The National Farmers Union has recently held its first annual conference since Brexit, and the farmers are understandably nervous about issues such as the loss of agricultural subsidies from Europe and the possible mass disappearance of cheap migrant labour in arable farming. Likewise, as I teach Geography to the secondary students, I am navigating my way through pages and pages of our textbooks, dealing with agriculture in less economically developed countries. The word “globalisation” seems to stand out from the page now: a great big, glaring, redundant term that makes our texts appear instantly out-of-date. It is like finding a typographic error four or five times on every page of the book. So the wider world out there is becoming a strangely mad world in which all that was certain is now becoming worryingly yesterday’s century, as we now discover that the 21st century is not just a continuation of what we knew. But I am doing simple things on a very local scale, pruning the last remaining vine in El Parral and taking the cuttings up to the top level terraces to begin establishing the vines that gave El Parral its name. A parral is a shady area in front of a house created by training grape vines over a frame, so it gives shade in summer but does not block light from the windows in winter when it dies back. After pruning the vine ready to try and grow much more fruit from the cuttings, and restore something of the parral using the original surviving vine stock, I reflected that it was a rather unwise thing to preach on the subject without ever having cut a vine. The parable is about the love of the Father and its symbolism is very rich. On the other hand, from a practical farming point of view, the parable misses the point that cuttings can become independent vines… In the light of experience, if I had my time again, I would spend more time farming and less time preaching. Don’t click on that photo… aaaaargh! Too late. Apparently the BBC World Service broadcasts an Afghan version which has 11 million listeners, compared with the 5 million UK audience for The Archers. It is called Naway Kor, Naway Jwand which means New Home, New Life. The title suggests it would be more suitable for me, but it would be hard to find someone in Finestrat to give me lessons in the Pashto language. Four healthy donks and a number of increasingly healthy looking fruit trees… Keep up the good work! Healthily Donkers! And yes, you have always had a close affinity with chickens… Soon it will be the real thing! The chicken project was very much delayed by the terrible storms and in the light of that experience, it might be better to populate the new chicken accommodation with rubber chickens rather than real ones, as they would be less prone to drowning or feather rot. Ha ha! More spooky toys for the Donks! That reminds me. As you know, the donks’ favourite toys are the old rubber wellies. (This seems quite typical of donks everywhere apparently: wellies are a common toy, probably because the donks associate them with their keepers.) Last week I found one of the wellies in the road outside. That means that it must have been hurled high in the air, enough to clear a two and a half metre fence! Suspicion falls on Morris. I just wonder what the legal situation might be if the wellington boot hit a fast moving downhill mountain biker who then collided with an uphill motorcycle trail biker who was then set upon by the unruly out-of-control labrador of the German walkers who come past at precisely 9.45 am every day. There is a great programme about mules on BBC Radio 4. It started at 11.30 pm. Lovely post describing your life Gareth. You’re closer to God not being as weighed down with material things but it’s not a life for the ‘chronic invalid’ like me. I do envy you although it’s a Sin!